Aquarium rocks serve many different purposes. Give your fish and other creates a place to explore, and can even provide a base for coral to grow. What are the best aquarium rocks? It depends what you’re looking for! How to Choose Rocks for Aquarium? To help you figure out what aquarium rocks are right for your tank, we researched some of the top rated ones available. This South Sea Base Rock from Carib Sea is absolutely beautiful. They’re formed from natural weather processes and erosion that creates gorgeous shapes that make any aquarium resemble the ocean floor. These rocks do more than just look good, though. They have an impressive 50% void space for unbelievable levels or porosity. Although water easily moves through this rock, it’s also extremely durable and long-lasting. Plus, all the little nooks and crannies are the perfect place for beneficial bacteria to thrive. 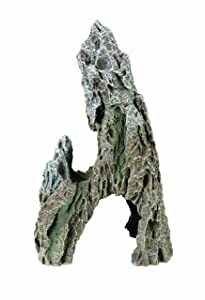 South Seas rock has more structure than almost any other rock used for aquascaping. It’s safe for all saltwater tanks and freshwater systems that run at a high pH. 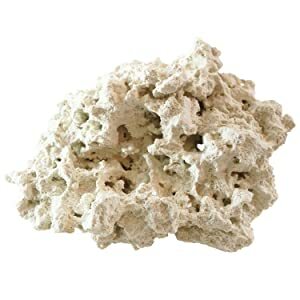 This rock is composed of calcium carbonate which supports a high pH and is harvested from ancient coral reefs underground. You can use it as an alternative to live rock or as a base to start a colony. Each and every one of these rocks is unique and they come in a lot of different shapes and sizes. If you want a larger rock than the one that arrives, it is safe to an aquarium-safe epoxy to create the shape you need for your own aquarium. For real dry rocks from the Atlantic, you can’t go wrong with this product from Worldwide Imports. Each of these rocks is unique. They come in various sizes and can be broken down or stacked to get the effect you’re looking for in your setup. This product comes with 40 pounds in all, made up of rocks of different shapes and sized. These rocks are exceptionally porous and harvested from various places in the Atlantic Ocean. They provide plenty of open space for beneficial bacteria colonies to flourish. 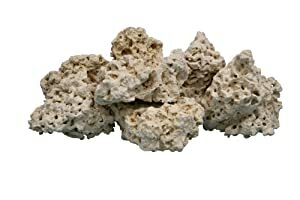 Because they’re real natural coral bedrock, they’re a great choice to begin a reef tank with or to place coral on. For a high-quality product that comes at a reasonable price, Worldwide Imports really comes through with this one. These coral base rock from Nature’s Ocean comes as 2 large pieces, about 12 to 17 inches each, for a total of about 40 pounds. In order to get the shape that you want, simply use a hammer and chisel to chip away at it until you have what you need. You’ll find that, as you work with the large pieces of rock, dust and other residue will fall away to open it up even more, revealing holes and tunnels that you may not have noticed right out of the box. 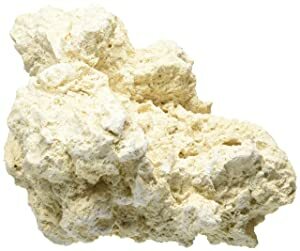 This is 100% premium all natural aragonite rock. They’re absolutely covered in holes and crevices which makes them exceptionally porous. It also allows you to create very elaborate and interesting setups if you’re building a base for new coral growth. It makes a great addition to established coral tanks, too. Because of the porosity, these rocks also serve as a perfect home for beneficial bacteria to grow which will help control the nitrate levels in the tank. What’s special about ARC Reef is that they handpick every piece of rock according to 3 criteria. It has to look amazing, have an interesting shape, and be extremely porous. Of all the rocks they go through, only about 5% end up being picked so it’s a safe bet that this is some of the best looking, most porous rock you can find. This rock requires no curing. It’s sustainable harvested and environmentally friendly. Because it’s made from calcium carbonate, it’s a great way to help control the pH in the aquarium, too. 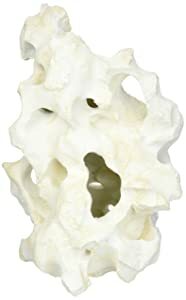 One of the great things about this brand it that the pre-drill 6 holes into every rock so that you can stack them and create your landscape without worrying about having a spot open to receive corals. And here’s the kicker, for every pound you buy, ARC Reef deposits 5 pounds of reef material back into the ocean to help facilitate new reef growth. 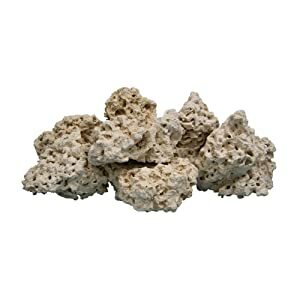 This next rock from Carib Sea is a South Seas base rock that’s perfect for marine and reef tanks or if you’re looking for something to add with African cichlids. It’s a great base for live coral because it’s clean and extremely porous with both macro and microparasites. 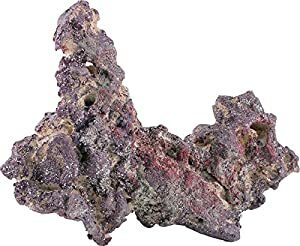 There’s no need to cure this rock, it’s ready to go into your aquarium right away. This package contains 10 pounds total but since each rock is unique, the number of pieces in each package varies. A great thing about this rock is that it’s full of so many nooks and crannies that building a structure to fit an aquascape is pretty simple. Life Rock has an incredible amount of both macro and microporosity that’s already infused with spored bacteria which helps establish colonies rapidly once it’s placed in an aquarium. These rocks do not require and curing and won’t cause any pH spikes or increase nitrate levels in the water. The shape is really special, too, and perfect for facilitating growth in any saltwater environment. Open air shapes and an abundance of nooks and crannies are great for bacterial colonies and providing tunnels, arches, and caves for marine life. Because this is natural rock, each piece is different. This package includes 20 pounds of rocks in all but each will include different shapes and sizes. If you end up with small pieces and you wanted something larger, using saltwater-safe epoxy to glue several pieces together is an easy, inexpensive fix. For a piece that really makes a statement, this outcrop from Marine Naturals will definitely catch some eyes. These large, intricately designed formations can be used individually or with others to create arches, cavities, and tunnels that fish will love because it gives them a lot of nooks and crannies to swim through and hide in. This product is made from non-toxic material that won’t affect the chemistry of the water. It’s safe for both freshwater and saltwater aquariums. Last up on our list is the man-made Texas holey rock from Deep Blue. Although this isn’t a natural rock, no one will be able to tell because they look so realistic. In fact, when inside an aquarium, it’s indistinguishable from the real thing. Deep Blue uses polyresin material that’s safe for any aquatic environment and won’t alter the chemistry of the water. It’s safe for both plant and animal life. This design is very tall and hollow and fish love it. They’re drawn to it as it adds interest to their environment. It adds interesting arches and holes for them to swim through and creates a centerpiece in the aquascaping. There are several types of natural rocks that you can put into an aquarium. They’re sorted into 3 categories: sedimentary, igneous, and metamorphic. Sedimentary rocks include limestone, sandstone, and shale. They were created from small particles and pieces of sediment that are deposited over time and pressed together. As time passes, the cycles repeat. This forms layers that are actually visible in most sedimentary rock formations. Igneous rock forms when molten rock from the earth’s core either crystalizes or makes it way to the surface. Finally, metamorphic rock is the result of another type of rock being exposed to intense heat and pressure which changes it from one form to another. Make sure you do your research before adding any rock to your aquarium that doesn’t come from a reputable company. There are some you should definitely avoid, including limestone, marble, geodes, dolomite, and shells or crushed coral in tanks except for those that house African cichlids. Also, keep in mind that not all aquarium rock you purchase is natural rock. There are companies today that make polyresin rocks that look just as real as what you’d actually find out in nature. They’re usually a little bit cheaper than the real thing but, because they’re made from molds, they don’t provide as much variety. There are some important things to keep in mind when choosing rocks for your aquarium. First, you have to know that the rock is aquarium safe. If you order from a reputable company, you’re pretty much guaranteed to receive an aquarium safe product. Though it may be tempting, it’s not a good idea to pick rocks up in the outdoors and assume they’re safe to put into any tank. Avoid any rocks that have sharp edges. Some of the natural rock that we included on our list might break in shipment or you might choose to make adjustments to its shape and size. If that’s the case, make sure you round off any sharp edges. If you’re using real rocks that aren’t hollow or porous, make sure you don’t go over the weight limit for your aquarium as this can cause significant damage. Also, make sure there’s a layer of sand or pebbles between the rocks and the glass bottom of the tank. Soak or clean any rocks before you add them to your aquarium. Some rocks will actually need to be cured by boiling them in water. Follow the instructions included with your aquarium rocks to be on the safe side. When it comes to choosing the best aquarium rock, there are a lot of things to think about. Do you want natural rock or man-made? Something just for looks or are you looking for a solid base to begin a reef tank? Regardless of your needs, the aquarium rocks that we’ve included in these reviews are some of the best ones available. We’re sure you’ll find one that’s just right for your aquascape.